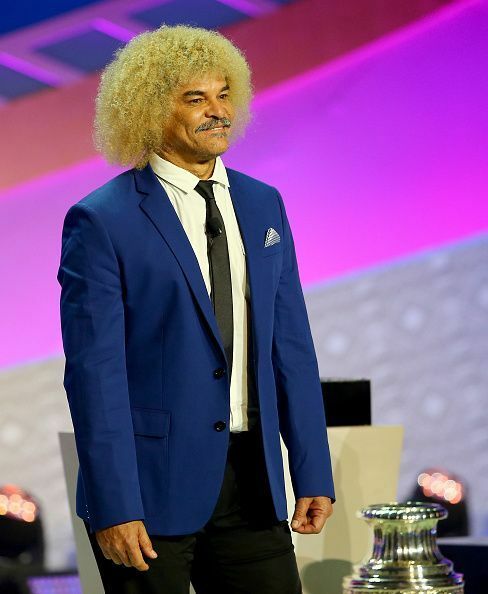 Carlos Alberto Valderrama Palacio, popularly known as “El Pibe”, is a former Colombian professional footballer. He was born on 2 September 1961 in Santa Marta, Colombia. Valderrama played as a midfielder and was had excellent playmaking abilities including precise passing and a wide range of technical skills. He is also considered to be Colombia’s greatest ever footballer and also one of the greatest ever in South America. Valderrama began playing football in 1981 for Union Magdalena in the Colombian first division. He had a three year career there before he moved to other clubs. Due to his height, Valderrama earned the nickname of “El Pibe” which means “The kid”. In spite of this height disadvantage, Valderrama was skilful and also surprisingly good in the air. He has represented the following teams - Union Magdalena, Millonarios, Deportivo Cali, Montpellier, Real Valladolid, Independiente Medellin, Atletico Junior, Tampa Bay Mutiny, Miami Fusion, Colorado Rapids, and the Colombian national team. Valderrama made his debut for Union Magdalena in the 1981-82 season. On 27 October 1985, Valderrama made his international debut in a 3-0 loss to Paraguay. Valderrama had an international career that spanned a total of 13 years during which he made 111 appearances, making him the only Colombian player to have 100 caps in international football. He was a part of the team in three World Cups (1990,1994,1998) and five Copa America tournaments (1987,1989,1991,1993,1995). He was made captain for the 1987 Copa America where he led his team to a third place finish. He was also named as the Player of the Tournament. Valderrama was named as the captain for the 1990 World Cup. He played a crucial role in helping his team proceed to the knockout rounds where they lost 2-1 to Cameroon. In 1993, Valderrama led a Colombian side to a mighty 5-0 win over rivals Argentina which led to their qualification for the 1994 World Cup. They crashed out of the World Cup in the group stages itself, which was also the case in the 1998 World Cup. Valderrama played his final match against England in a 2-0 loss. He had scored 11 goals throughout his career. Valderrama spent his initial years of footballing in South America and Europe. He started at Union Magdalena in Colombia where he played 94 league games and scored 5 goals. He moved to Millonarios in 1984 where he spent just one year making 33 appearances before moving to Deportivo Cali in 1985. He made 131 appearances and scored 22 goals. In 1988, Valderrama moved to France where he played for Montpellier and won the French Cup in 1990. He then joined Spanish side Real Valladolid in 1991 for a season before returning to Colombia where he played for Independiente Medellin and Atletico Junior where he won the league twice. Valderrama joined Major League Soccer in its inaugural year 1996. He joined Tampa Bay Mutiny where he would create records in providing assists. In the 2000 MLS season, Valderrama provided 26 assists in just one season which remains an individual record till this date. Valderrama played for two other clubs in the MLS - Miami Fusion and Colorado Rapids. He holds the second position in all-time assists after Steve Ralston - 114 and 121 respectively.